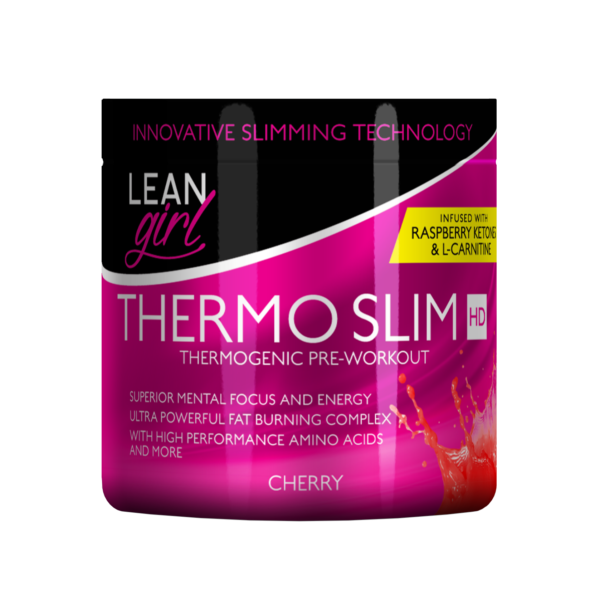 LEAN GIRL’s innovative Thermo Slim HD, pre-workout and slimming formula, delivers explosive energy as well as a powerful thermogenic response. Infused with your ultimate fat burning ingredients: Caffeine, Citrus Aurantium, Raspberry Ketones and over 1 000 mg L-Carnitine per serving, with added Chromium Picolinate, stabilises blood sugar levels and curbs sugar cravings. Not to mention, the benefits of strength enhancing Creatine and Taurine, along with our ingenious blend of Beta-Alanine and L-Arginine to improve circulation throughout the body. It’s no wonder you about to have an exhilarating experience. Maltodextrin, Malic Acid, Silicon Dioxide, Citric Acid, Flavour, Sucralose, Colour E124. Mix one level scoop with 400-500 ml cold water and drink 15 minutes before training.